Correlated uncovers surprising connections between seemingly unrelated things, and you can help by answering the weekly poll. At the end of the week, we'll tally up all the poll responses and compare the results to all of the previous polls. Check back to see which answers have the strongest correlation. I would like to get, or I have gotten, laser hair removal treatments. Log in or Create an account to see the current results for this poll. "Pretty much the best website ever." "Help further the cause of science!" Part of the math curriculum at Colgate University. Find a Baby, Buy This Book, and Start Experimenting! 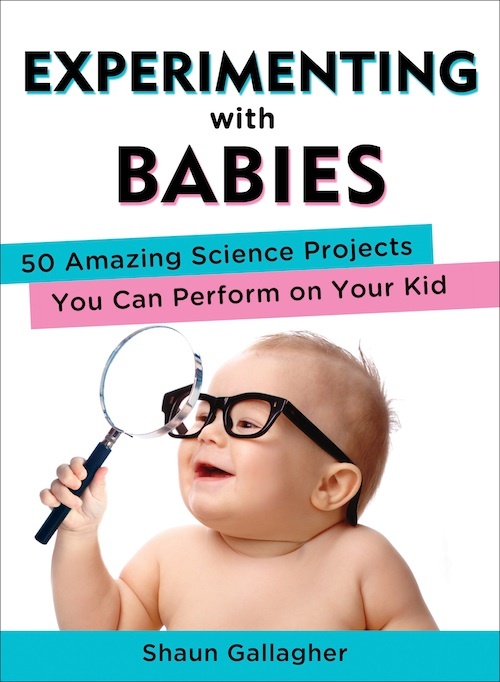 Correlated founder Shaun Gallagher is the author of "Experimenting With Babies: 50 Amazing Science Projects You Can Perform on Your Kid," in stores now. (You can also order it online at a great price!) The book shows parents how to recreate landmark scientific studies on cognitive, motor, social and behavioral development � using their own little bundles of joy as the research subjects. "Experimenting With Babies" makes a great, inexpensive gift for new parents, especially those with a quirky or geeky side. And buying the book is strongly correlated with being awesome. 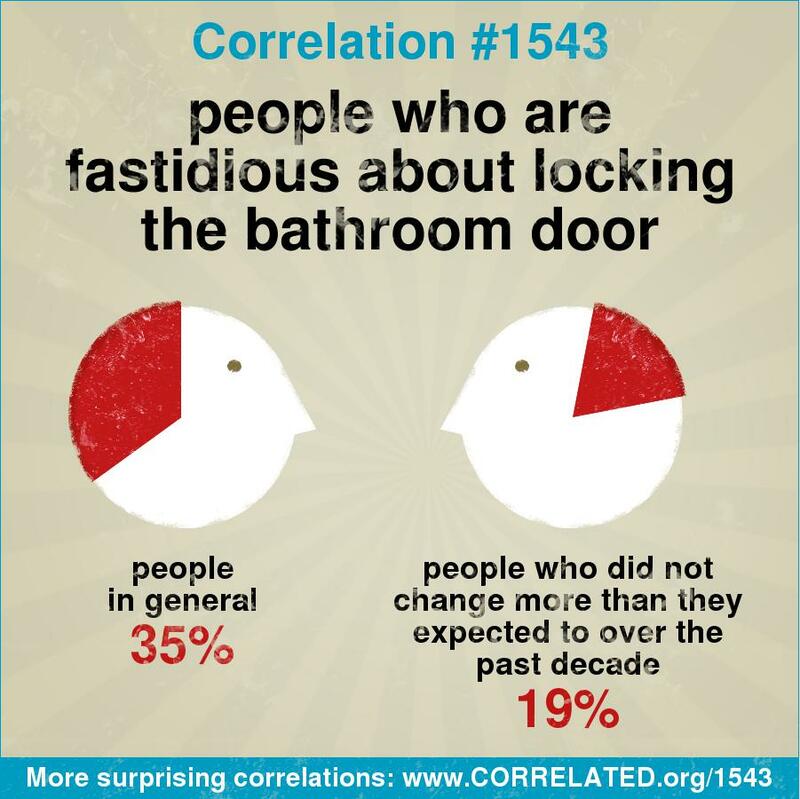 In general, 35 percent of people say they are fastidious about locking the bathroom door. But among those who say they did not change more than they expected to over the past decade, only 19 percent are fastidious about locking the bathroom door. Based on a survey of 156 people who say they did not change more than they expected to over the past decade and 618 people total. In general, 58 percent of people follow a certain sequence when they brush their teeth. But among those who say the strength of their handshake is always the same, 77 percent follow a certain sequence when they brush their teeth. 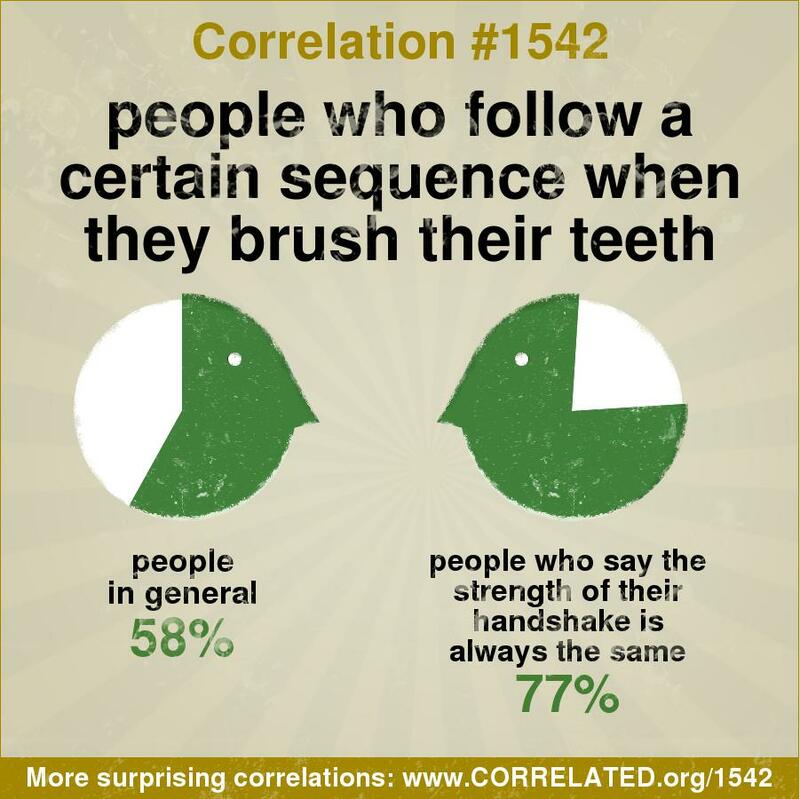 Based on a survey of 235 people who say the strength of their handshake is always the same and 476 people total. In general, 54 percent of people say they typically walk when traveling on an escalator. 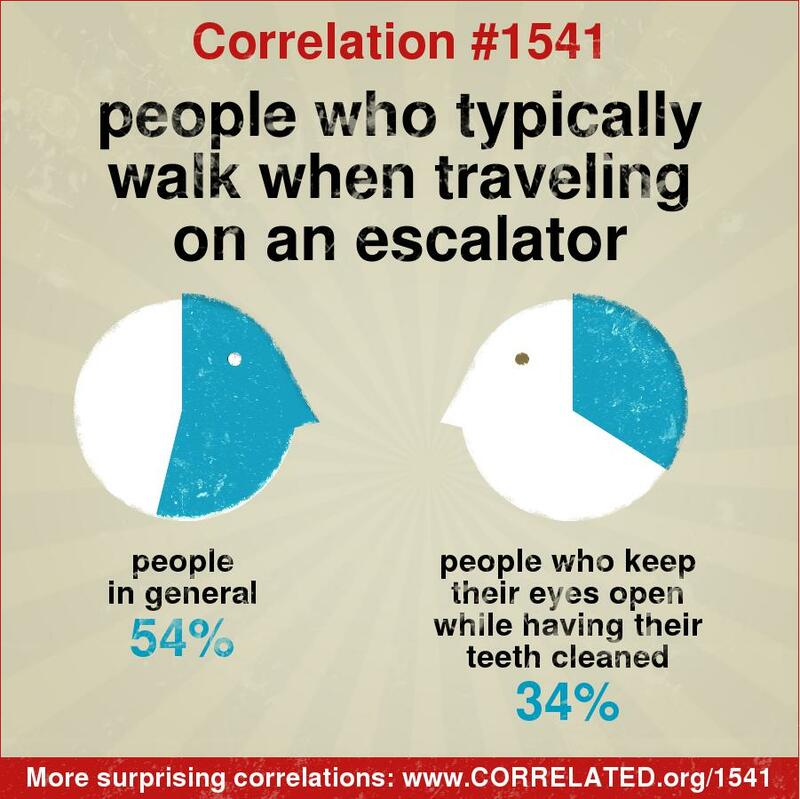 But among those who keep their eyes open while having their teeth cleaned at the dentist, only 34 percent walk when traveling on an escalator. Based on a survey of 334 people who keep their eyes open while having their teeth cleaned at the dentist and 554 people total. 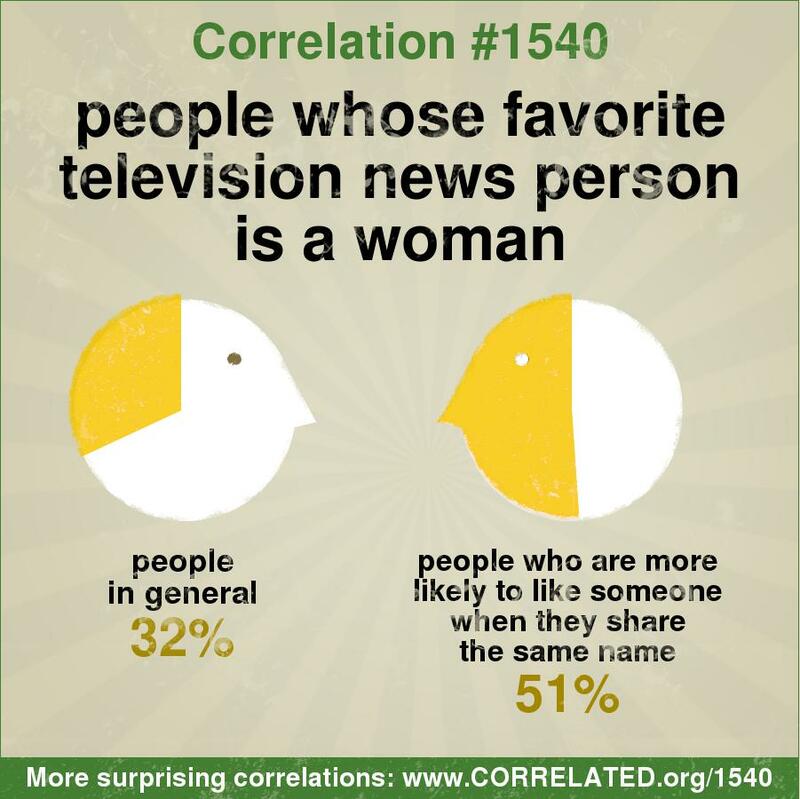 In general, 32 percent of people say their favorite television news person is a woman. But among those who say they are more likely to like someone when they share the same name, 51 percent say their favorite television news person is a woman. Based on a survey of 436 people who say they are more likely to like someone when they share the same name and 823 people total. In general, 51 percent of people say they like candy corn. 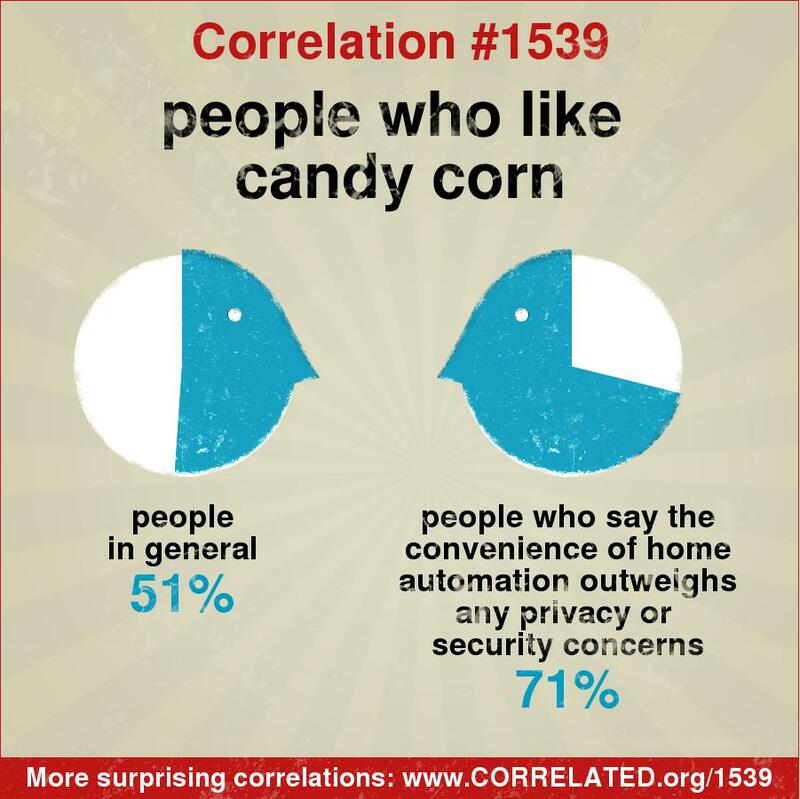 But among those who think the convenience of home automation outweighs any privacy or security concerns, 71 percent like candy corn. Based on a survey of 143 people who say the convenience of home automation outweighs any privacy or security concerns and 507 people total. 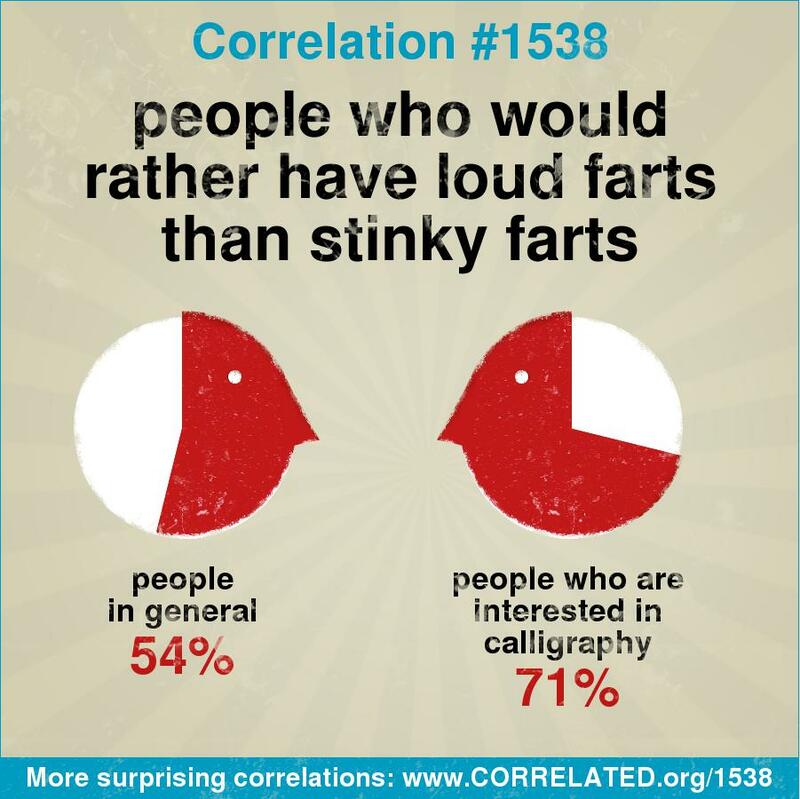 In general, 54 percent of people would rather have loud farts than stinky farts. But among those who are interested in calligraphy, 71 percent would rather have loud farts than stinky farts. Based on a survey of 167 people who are interested in calligraphy and 369 people total. In general, 48 percent of people say they wash their own cars. 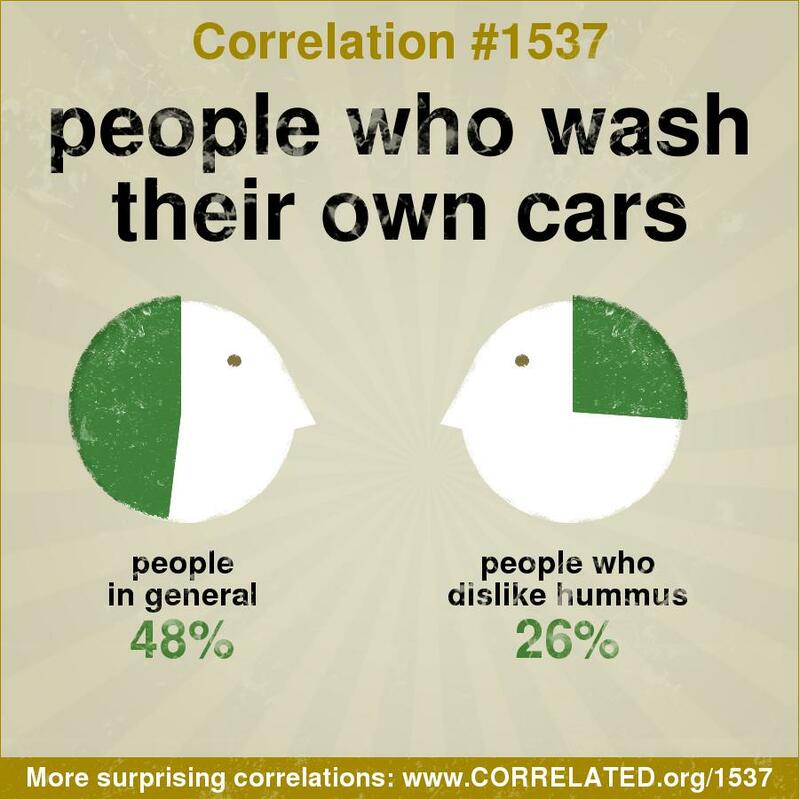 But among those who dislike hummus, only 26 percent wash their own cars. Based on a survey of 222 people who dislike hummus and 681 people total. In general, 45 percent of people like radishes. 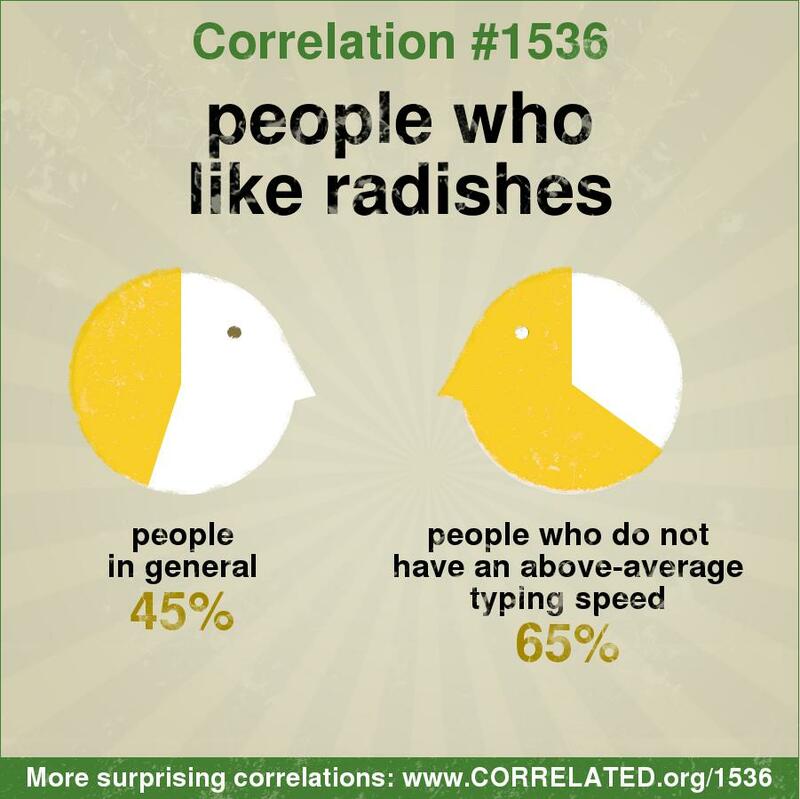 But among those who say they don't have an above-average typing speed, 65 percent like radishes. Based on a survey of 166 people who say they don't have an above-average typing speed and 427 people total. In general, 19 percent of people say they order Chinese takeout regularly. 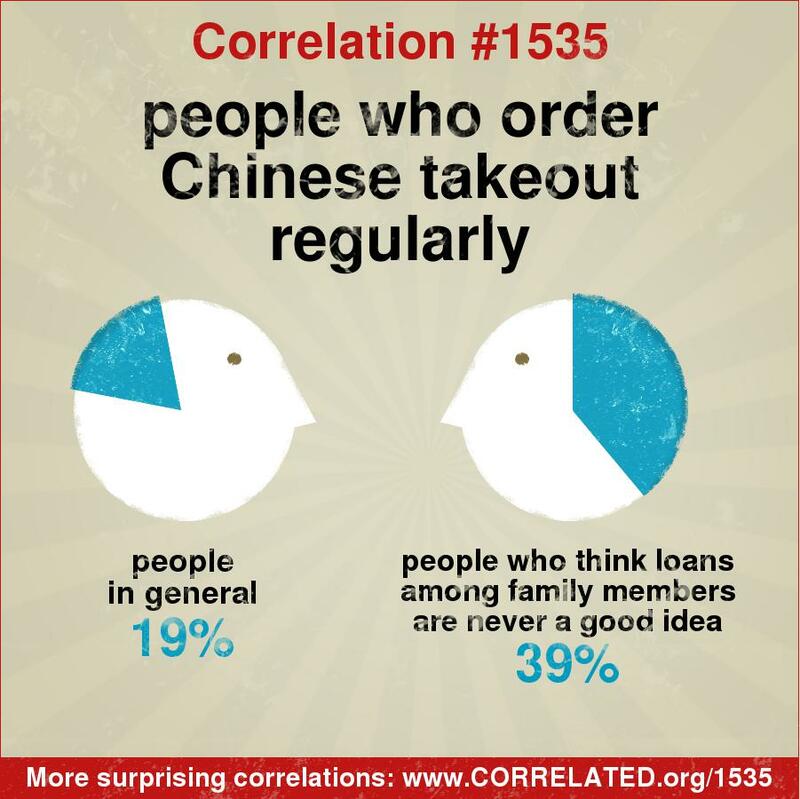 But among those who think loans among family members are never a good idea, 39 percent order Chinese takeout regularly. Based on a survey of 149 people who think loans among family members are never a good idea and 466 people total. In general, 40 percent of people think Mickey and Minnie are married. 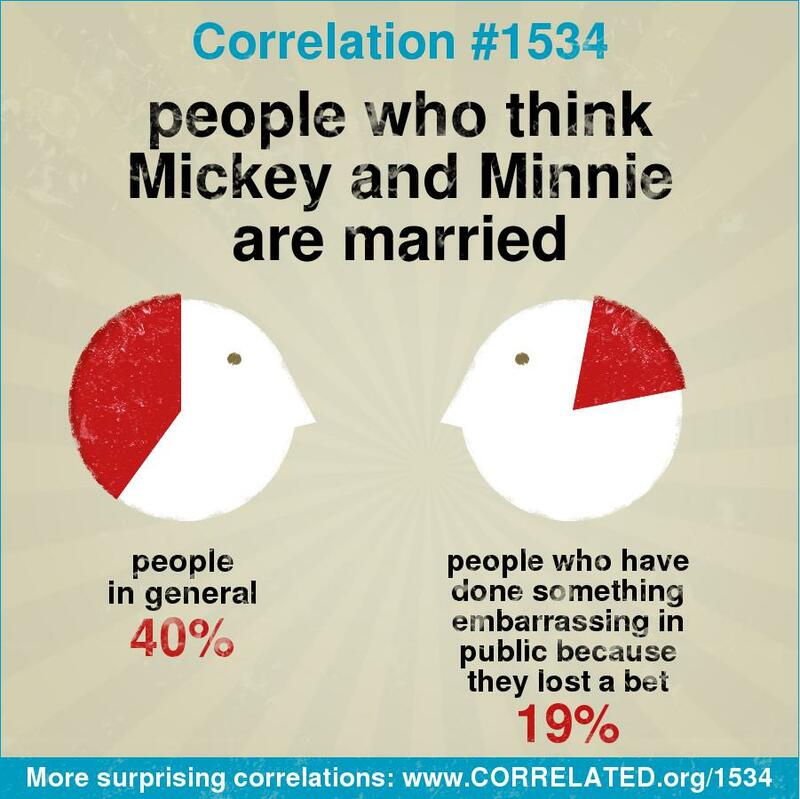 But among those who have done something embarrassing in public as a result of losing a bet, only 19 percent think Mickey and Minnie are married. Based on a survey of 103 people who have done something embarrassing in public as a result of losing a bet and 422 people total. In general, 49 percent of people say the worst fight they've ever been in has been with a family member. 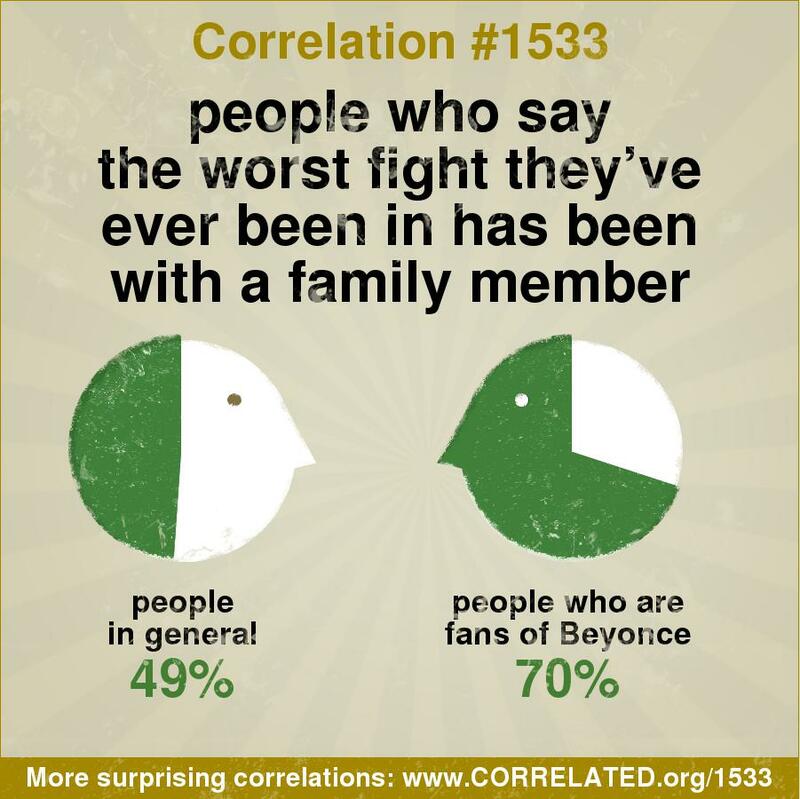 But among those who are fans of Beyonce, 70 percent say the worst fight they've ever been in has been with a family member. Based on a survey of 256 people who are fans of Beyonce and 703 people total. In general, 53 percent of people consider themselves more generous than the average person. 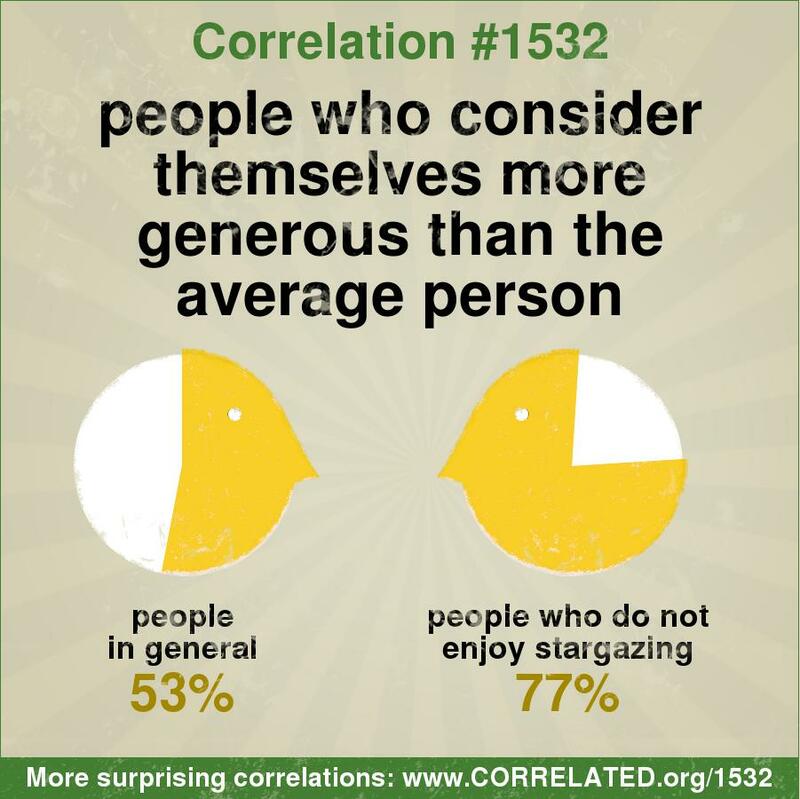 But among those who don't enjoy stargazing, 77 percent consider themselves more generous than the average person. Based on a survey of 95 people who don't enjoy stargazing and 543 people total. In general, 51 percent of people prefer multicolored Christmas lights to monochrome lights. 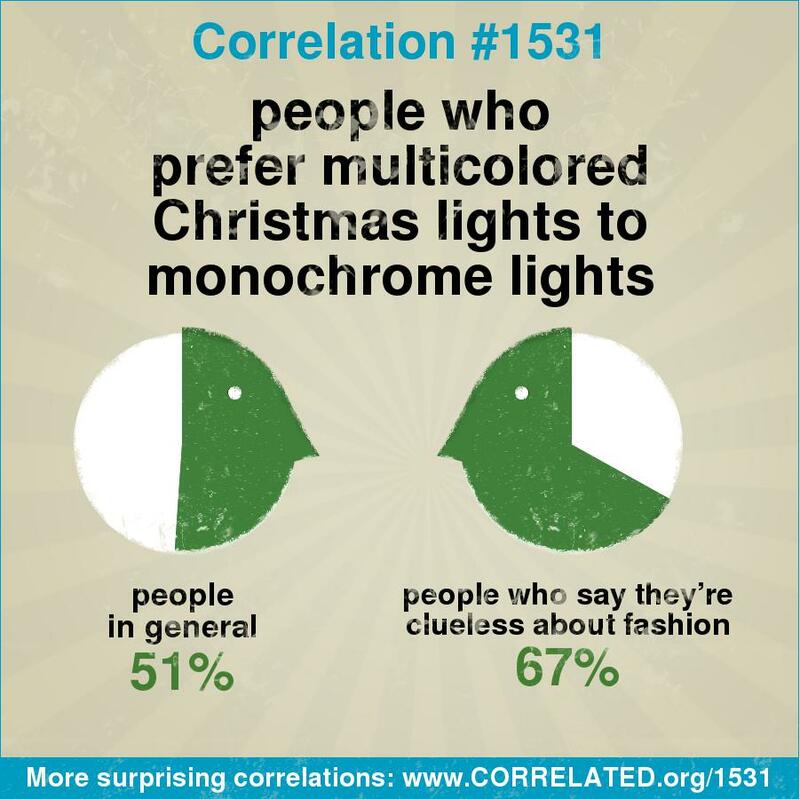 But among those who say they're clueless about fashion, 67 percent prefer multicolored Christmas lights. Based on a survey of 374 people who say they're clueless about fashion and 596 people total. In general, 48 percent of people draw the hat separately when they write the number 5. 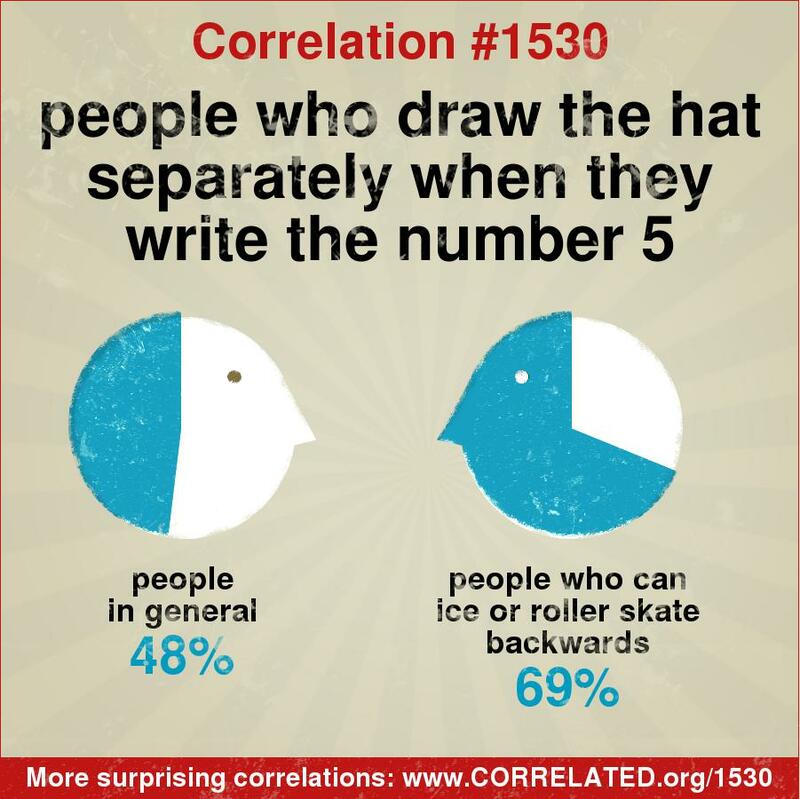 But among those who can ice or roller skate backwards, 69 percent draw the hat separately when they write the number 5. Based on a survey of 97 people who can ice or roller skate backwards and 372 people total. In general, 53 percent of people say they tend to second-guess to their decisions. 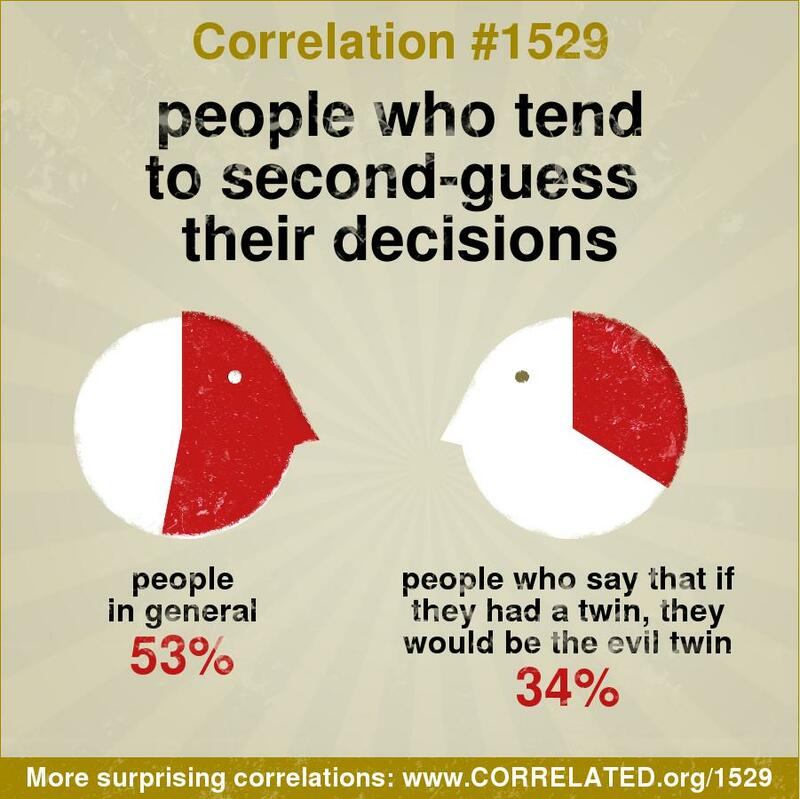 But among those who say that if they had a twin, they would be the evil twin, only 34 percent tend to second-guess to their decisions. Based on a survey of 109 people who say that if they had a twin, they would be the evil twin and 319 people total. In general, 55 percent of people say they stay in the movie theater until the credits end. 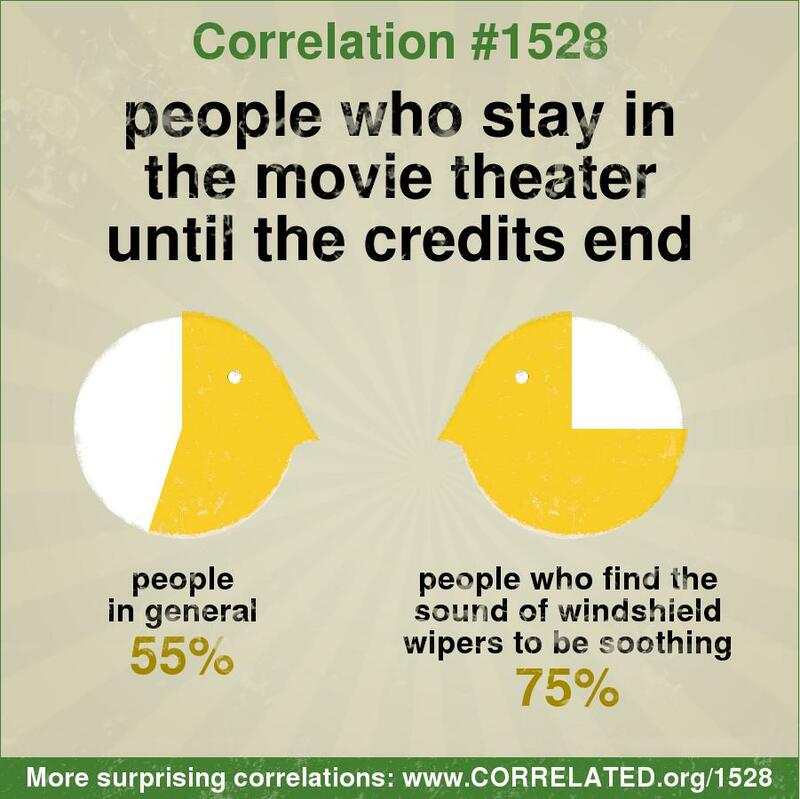 But among those who find the sound of windshield wipers to be soothing, 75 percent stay in the movie theater until the credits end. Based on a survey of 131 people who find the sound of windshield wipers to be soothing and 352 people total. In general, 48 percent of people are more willing to buy off-brand clothing than off-brand food. 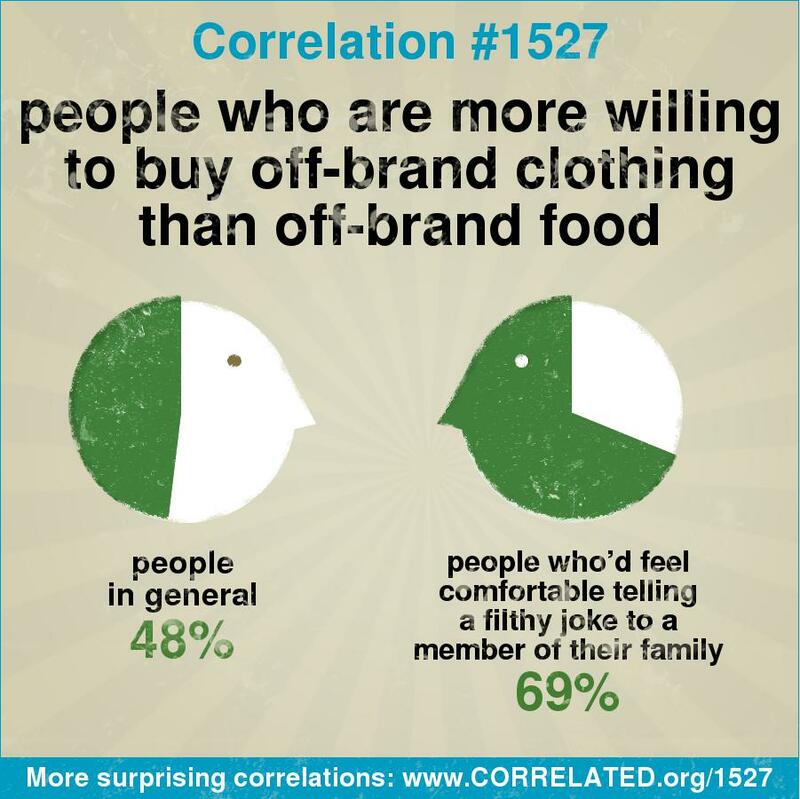 But among those who say they'd feel comfortable telling a filthy joke to a member of their immediate family, 69 percent are more willing to buy off-brand clothing than off-brand food. Based on a survey of 147 people who'd feel comfortable telling a filthy joke to a member of their immediate family and 359 people total. In general, 49 percent of people think a woman should take her husband's last name. 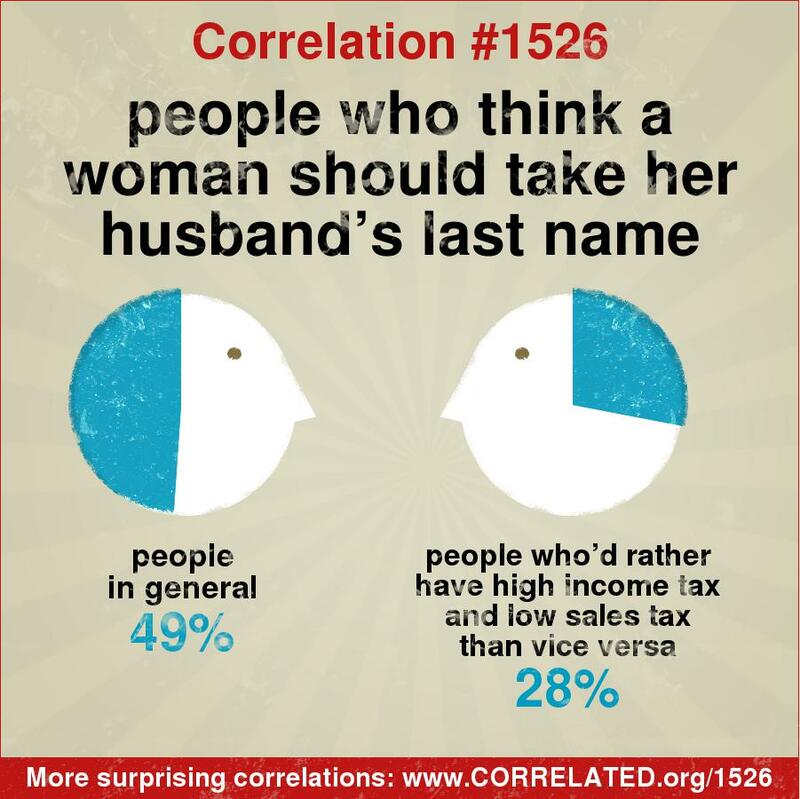 But among those who'd rather have high income tax and low sales tax than vice versa, only 28 percent think a woman should take her husband's last name. Based on a survey of 208 people who'd rather have high income tax and low sales tax than vice versa and 434 people total. In general, 62 percent of people say they like olives. 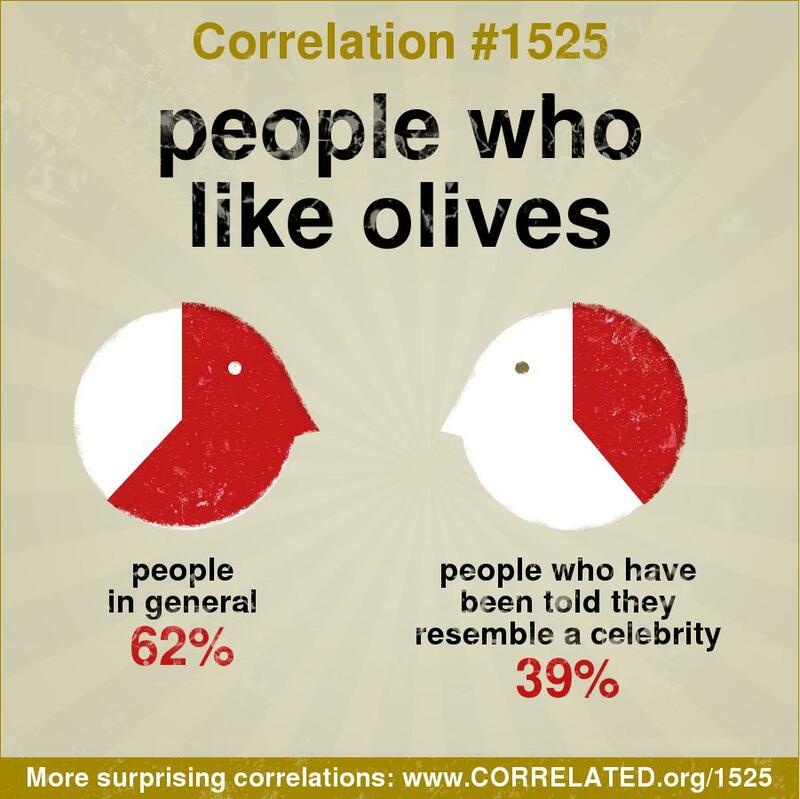 But among those who have been told they resemble a celebrity, only 39 percent like olives. Based on a survey of 156 people who say that they've been told they resemble a celebrity and 439 people total. In general, 29 percent of people say they were thumb-suckers as kids. 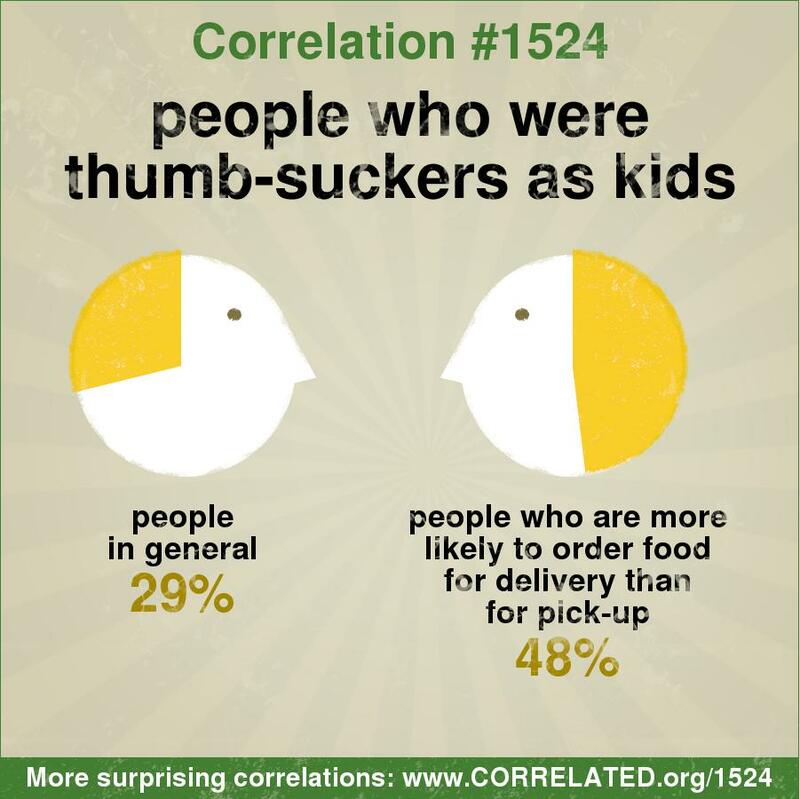 But among those who are more likely to order food for delivery than pick-up, 48 percent were thumb-suckers. Based on a survey of 227 people who are more likely to order food for delivery than pick-up and 479 people total. Thanks! We've recorded your response! To make correlations, we need to track your survey responses over time. Please log in, or create a free account below. Log in below. If you've forgotten your password, enter your email address but leave the password field blank. A new password will be emailed to you. Are apartment dwellers more likely to read comic books? Do people who square dance have higher-than-average auto accident rates? Are people who drive domestic cars more likely to prefer Coke over Pepsi? 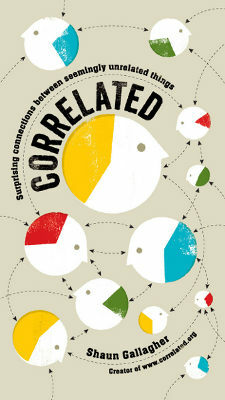 Correlated helps discover surprising correlations between seemingly unrelated things. By answering each day's survey question, you'll help us make new correlations. It's fun. It's painless. It's free. Enjoy.